AN OLD JOKE says that preaching is the art of talking in other people’s sleep. Charles Haddon Spurgeon turned that joke around; he once preached a sermon while he slept. One Saturday night Spurgeon began talking in his sleep. His wife, Susannah, heard the noise and awoke. She realized her husband was preaching, so she listened attentively and in the morning gave her husband a detailed summary. A few hours later, he preached that sermon to his congregation. 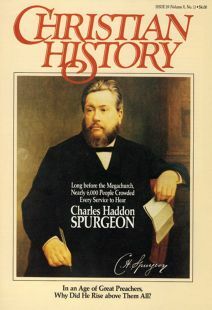 Marked by vivid word choice, ringing assertions, and sharp, sometimes barbed, wit, Spurgeon’s sermons clearly connected with his listeners. He told the story, for instance, of meeting a man who identified himself as an agnostic. Even in his own day, Spurgeon was considered the “prince of preachers.” A young artist named Vincent Van Gogh preached Spurgeon’s sermons in the ghettos of London, with numerous conversions. Missionary David Livingstone carried one of Spurgeon’s sermon tracts in his journeys across Africa. Today, Spurgeon’s influence is still felt. Tom Carter, author of Spurgeon at His Best (Baker, 1988), wrote recently and said, “Each time I read one of Spurgeon’s sermons, I fall in love with preaching all over again. My faith is rescued from the temptation to consider the proclamation of God’s truth irrelevant. . . . This issue of Christian History explores the life and significance of this preaching giant, who continues to awaken preachers and preaching in our day. Even if he could preach with his eyes closed.